The following blog introduces you to South Dakota Badlands Photos and Tips from my photo workshop this June. 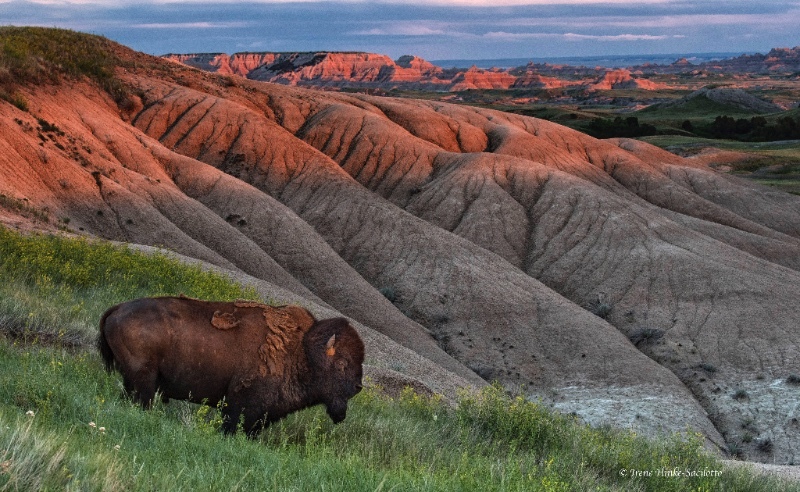 In early June, I conducted a photo workshop in the Badlands of South Dakota with co-leader Sandy Zelasko. It is a great location for dramatic landscapes with striped limestone formations, sharp pinnacles, canyons, and sprawling prairie grasslands frequented by pronghorn and mule deer. In the past, I conducted photo tours in the Badlands and Blackhills in the fall. But this time, Sandy and I elected to hold the workshop in early June when newborn animals were plentiful along with vibrant spring colors. On most days, temperatures were comfortable in the morning but rose as the day progressed. Therefore, we were on location to shoot sunrise and photographed throughout the early morning. Then we took a mid-day break at our hotel in Wall to rest, review images, photograph around town, and grab an early dinner before returning into the field until sunset. From Wall, it was only a 25-minute drive to the park’s northeast entrance and 15 minutes to Pinnacles Overlook. The small town of Wall has several good restaurants, a grocery store where we bought snacks and food for breakfast, and a gas station plus a few convenience stores. Note: Many of images you see in this newsletter were taken while scouting locations I the Badlands for the workshop. Sandy and I did photograph with clients at times but only if we were demonstrating techniques or in the event they did not desire our assistance. 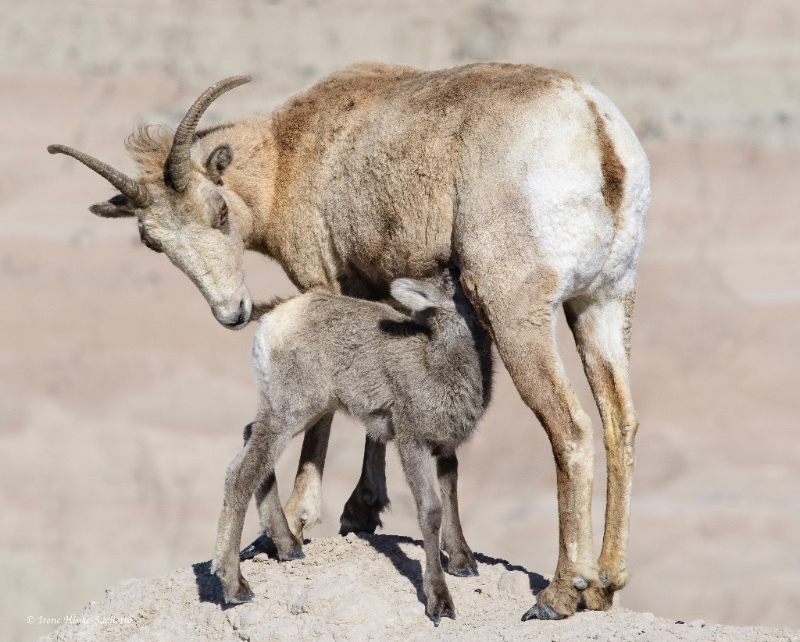 Bighorn sheep are social animals with the females and lambs living separately from the males until breeding season. Rams, we encountered several times at the northeast end of the park near Big Badlands Overlook and the parking area at Notch, Door, and Windows trails. Remarkably, the length of the rams curled horns are managed as not to block their vision. While we photographed, they occasionally engaged in mock fighting which will become quite aggressive during rutting season in November and December as they compete for the attention of the females and run at each other heads down and horns clashing. The sound of the impact reverberates throughout the canyons. Even the youngsters engaged in shoving matches practicing for their roles later in life. The sheep’s ability to climb steep slopes even when small is amazing and is possible because of the rough pads on the bottom of their flexible two-toed hooves. It is wise to use long lenses (300 mm or greater) when photographing wildlife as not to alter their behavior. Wild animals are not predictable and these sheep can actually run at speeds of 30 mph over level ground. 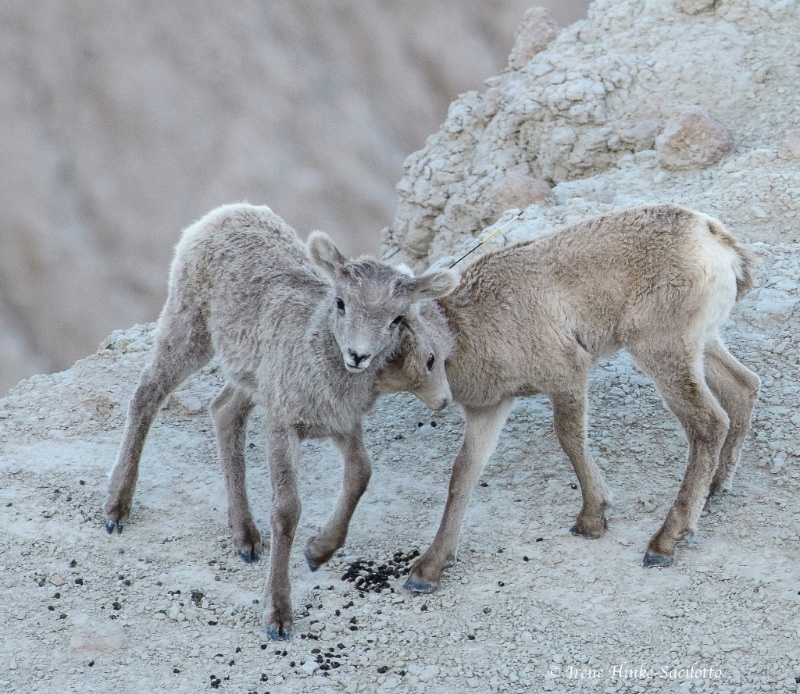 These bighorn sheep once populated the park and other areas in the western U.S. in large numbers. But due to hunting and habitat loss their numbers dropped to near extinction at the beginning of the century. 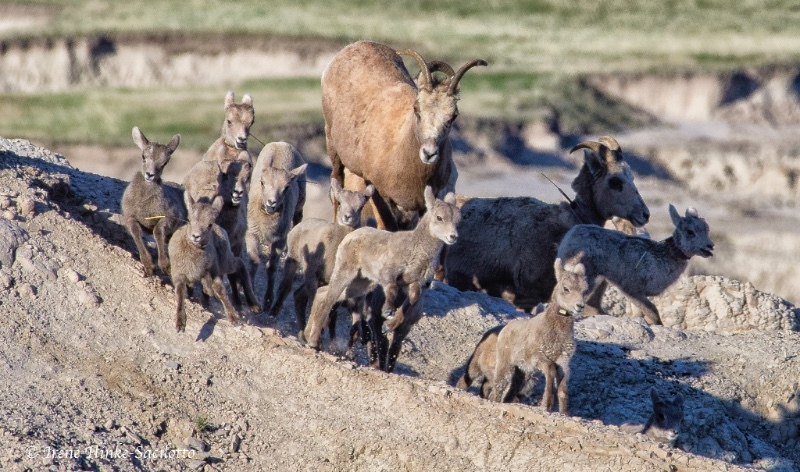 The bighorn seen the Badlands are Rocky Mountain sheep that were reintroduced into areas of the western U.S. 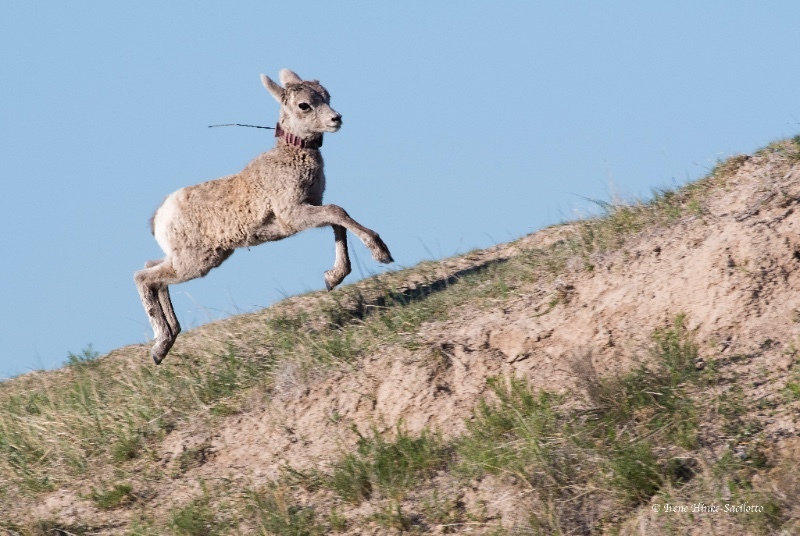 In the Badlands, researchers monitor the health and distribution of the bighorn population by capturing lambs just after birth and attaching collars with tracking devices that will eventually fall off. 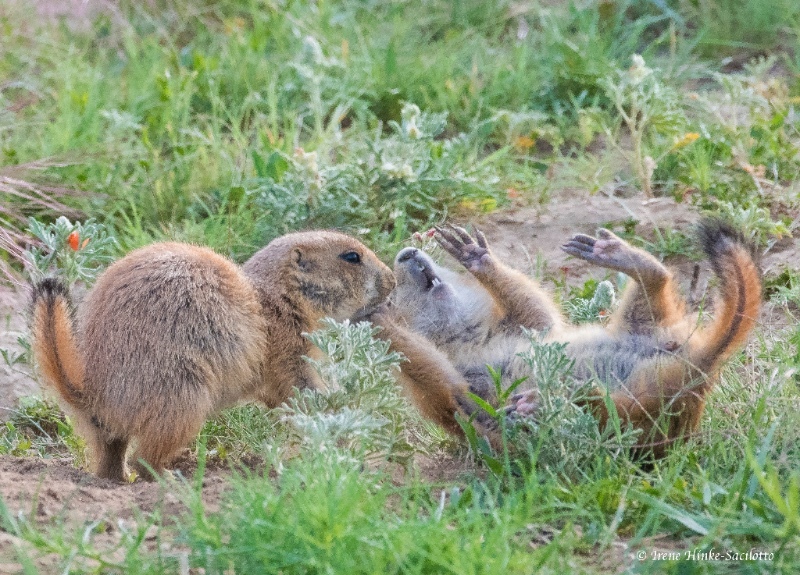 Young prairie dogs were one of the most entertaining but challenging subjects in the park to photograph. Our favorite family group was along Quinn Road where there was little traffic or disturbance. We photographed the youngsters at eye-level, lying on our bellies and using bean bags or low tripods for camera/lens support. This approach provided us with an intimate view of the animals and an out of focus background. Even though the background was blurred, we had to carefully examine the image in the viewfinder to be sure there are no strong forms or bright objects that could distract the viewer’s attention. 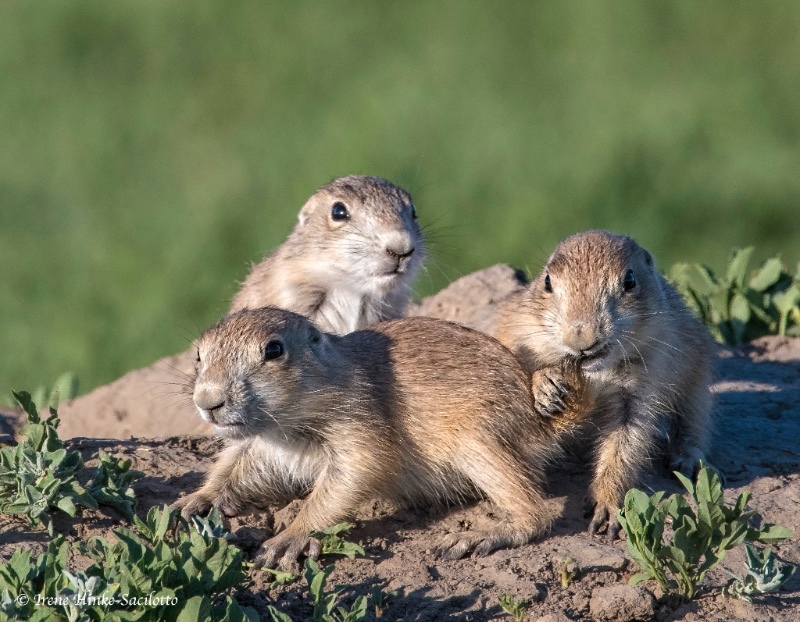 The small prairie dogs were more animated than the adults particularly in the morning and during the cooler parts of the day. Therefore, we concentrated our effort on photographing them under those conditions, trying to capture their interactions — nuzzling, tail pulling, and playing. Sage Creek Rim Road was the best location for bison. Late one afternoon as the sun was setting, I photographed a bison lit by the setting sun with the warm light illuminating the badlands in the background. One of my favorite photos from the trip. For dramatic landscape photos, we shot when the sun was low in the sky, warming and intensifying colors, and emphasizing the relief of the land. In the spring the weather is less stable than at other times of the year resulting in large cumulus clouds appearing in the afternoon along with dark, threatening storm clouds. Both add interest to images by replacing boring washed out or solid blue skies. 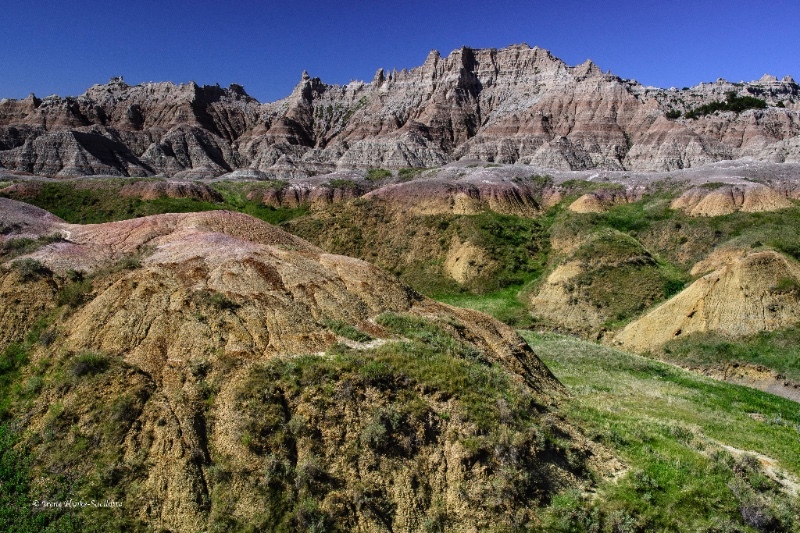 Some of the better views of the Badlands were at Yellow Mounds, Conata Basin, and Panorama Point Overlooks and the area from the Ben Reifel Visitor Center to Norbeck Pass. I particularly liked the views along the loop road from Pinnacles Overlook to Conata Road. There were convenient pull-offs along the way where we could stop and photograph multi-colored yellow mounds with contrasting banded formations in the background. Some of the locations we used for sunrise and sunset photography were at or near Pinnacles Overlook, the red eroded rocks along Sage Creek Ridge Road, Big Badlands Overlook and at Windows, Door, Notch Trails. Sheep Mountain Table is in the south unit of Badlands NP. At the base of the plateau there are unusual rock nodule and toadstool-like formations. The road leading to the top is narrow and dirt can be treacherous after hard rains. We had a limited amount of time to explore the area due to an approaching storm with ominous dark clouds. 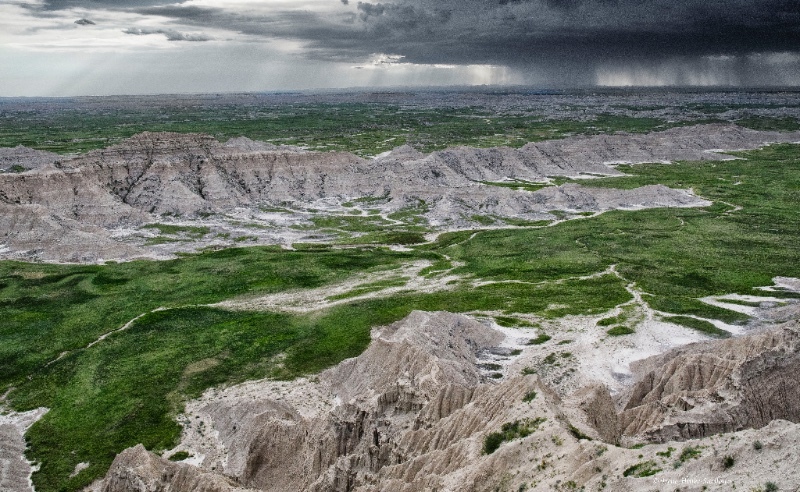 However, it was the storm that added dimension to our images of the surrounding badland formations. Among the grasses on top of the table, we found the giant fuzzy puff balls containing seeds for the flower goat’s beard. One participant with a mirrorless camera took photos of the plant using a macro lens with a modeling light built-in. When comparing his images taken with this set-up to mine, his were far superior as the light penetrated to the center of the sphere. Great job Jim! When the light on a scene was flat due to heavy clouds or deep shade, I still took photos using high ISOs to freeze action and hoped for the best. In many cases, the high ISOs resulted in unacceptable noise levels in my images (looks similar to film grain). I used Nik and Topaz software plug-ins with Adobe Photoshop and Lightroom to reduce the noise but I was not always satisfied with the results. What was worse, the subjects appeared unrealistically flat and blended with the background. On the last day of the trip, I resorted to shooting video with my Nikon D500 camera, something I had only tried once before. My results from that day were not always perfect due to the wind, a focus issue, and my inexperience. However, because the animals were moving and interacting during the video. they no longer blended into the background and the images were much more engaging. Needless to say, I plan to learn more about filming videos and plan to experiment with the technique more in the future. 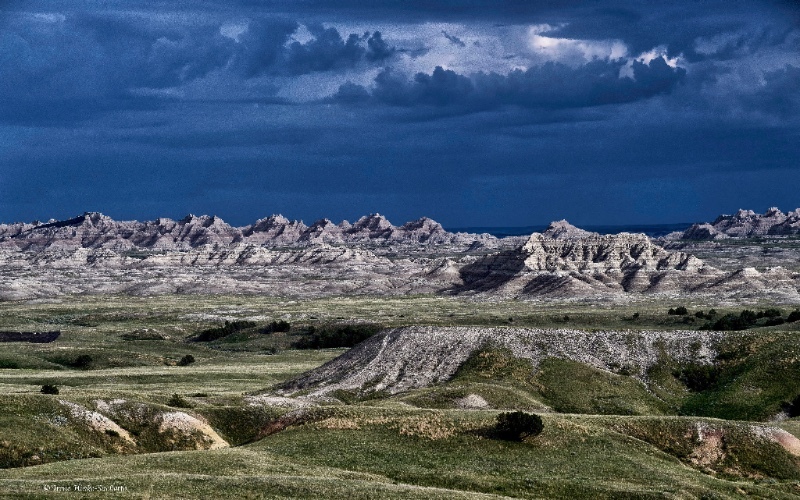 Images in this blog are from scouting trip and photo workshop in the South Dakota Badlands. Planning similar program in 2018.